The longer a labour supply chain, the higher the risk of encountering forced labour somewhere along it, according to a new study, “Accountability for forced labor in a globalized economy”. 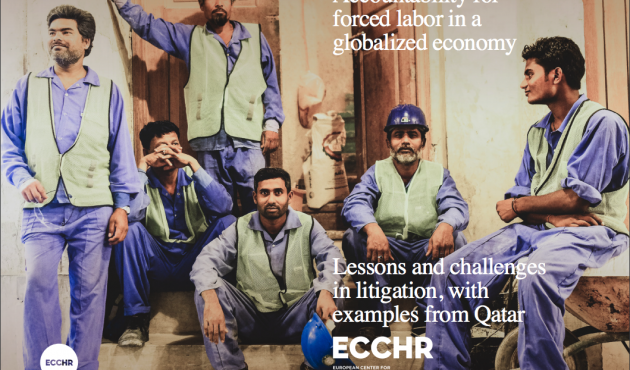 Supported by the Freedom Fund, this report investigates whether transnational companies from Europe contribute to forced labour along their supply chains in the construction sector in Qatar and whether they can be held accountable in court. Interviewed migrant workers from Bangladesh, Nepal, Pakistan and Kenya working in Qatar and Saudi Arabia confirmed the widespread use of practices that, in sum, constitute forced labour. At the recruitment stage, these practices include illegal recruitment fees, contract substitution and corruption. At the employment stage, migrant workers noted passport retention, delay of legal residence papers with resulting risks of arrest, fines and deportation, delays and deductions of salary payments, the prohibition to change jobs and serious work accidents. These practices are outlawed in the states where they occur, but recruiters and employers frequently disregard local laws, often with impunity. Yet, they do not act alone. Their business partners, including foreign parent companies, contractors and joint venture partners, help sustain and benefit from such systemic exploitation. Thus, if one aims for systematic change, every actor in the transnational supply chain needs to be held to account. Inappropriate human rights due diligence that does not effectively address risks in the supply chain can result in criminal complicity or tort liability. The study found structural obstacles to corporate accountability and access to justice for migrant workers in Qatar: (1) Workers’ vulnerability: migrant workers do not know about their rights or the remedies available and economically depend on their jobs. (2) Trade unions are not accessible for migrant workers, which perpetuates their vulnerability. (3) The diversification and opaqueness of business structures disperse evidence across different jurisdictions and makes it difficult to track individual responsibilities. These obstacles are a consequence of the global economy’s market dynamics. The growing number of “working poor” – those most vulnerable to forced labour – is a socially constructed condition that sustains the global supply of cheap labour through migration and ensures the profitability of labour-intensive sectors. Labour supply chains dissociate transnational corporations from labour abuses on the ground. To minimize legal and operational responsibilities, companies operate through complex transnational business structures, including foreign subsidiaries, majority shareholding, joint ventures, subcontracting through several tiers, suppliers, franchising or management contracts, and recruitment is delegated to agencies and sub-agents. Yet, the longer the supply chain and the lower the level of monitoring and control, the higher the risk for the top end company of being directly linked to forced labour through its business relationships. A company that does not verify and act upon bad recruitment practices and labour exploitation in its supply chain sustain the conditions for forced labour and risks complicity. A company can manage this risk by conducting human rights due diligence that effectively responds to the specific risks in the labour supply chain, such as illegal recruitment fees, contract substitution and corruption. But human rights due diligence alone will not be a game changer, as long as structural conditions for impunity are not fundamentally addressed.